Stavroula’s kitchen is immediately striking. Situated in the Mastichari area of Kos, Stavroula’s home is located in the grounds of a hotel owned by her family’s business, where she also works. 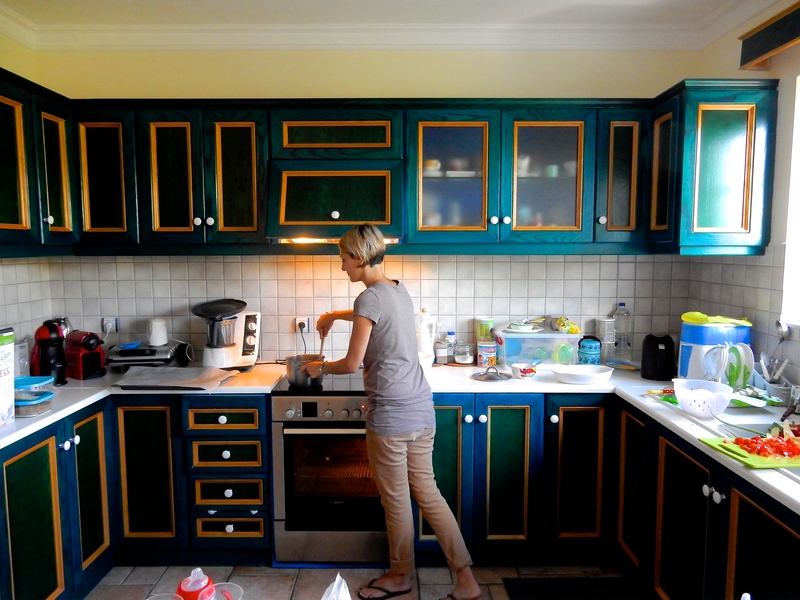 The kitchen’s teal and royal blue colour scheme was chosen by her father; the previous occupant of the apartment. Stavroula’s father was so passionate about teal, that many features of the apartment were originally finished in the same scheme, such as bookcases and doors. Since Stavroula and her family moved into the apartment, subtle, neutral tones have been introduced, and the kitchen is the sole remaining testament to her father’s infatuation with teal. The teal kitchen is now a symbol of Stavroula’s cooking evolution. “When I got married, I didn’t know how to cook, so I asked the chef at the hotel to tell me some recipes I could make in 30-40 minutes”. Perka (Perch fillet) with tomato and vegetable sauce is one of the recipes the chef shared with Stavroula. This dish is now a favourite among her family, particularly her sister Dimitra, and Stavroula makes it often, especially during winter, as it is an easy and healthy dish she can make after work. Since her marriage, Stavroula’s cooking repertoire has expanded. Married to an Italian, Stavroula enjoys cooking Italian food, often preparing her own pasta and gnocchi from scratch. However, sourcing specific ingredients for Italian style pasta can be difficult to access in a small island like Kos, as the Greek variations in flour are limited. However, there are many rewarding aspects regarding the availability of fresh food when living in an island like Kos. Stavroula cites the accessibility and quality of fish as one of the best things about eating and cooking in Kos, as well as potatoes, onions, eggplant, peppers and pumpkin which are grown locally. Stavroula’s family, (like many in Greece) grow olive trees in order to produce olive oil for personal use. Add white wine, tomato juice, pepper, salt and a little water, continue to simmer on low heat until ingredients are combined and fragrant.